Our large inflatables are for children 4 and over (it will fit 10-15 kids at one time) and you must supervise the occupants at all times. It must have a reasonably level surface for installation and must be within 50″ of an electrical outlet. Unfortunately, we cannot allow our inflatables to be used in the rain or in high winds so any cancellations due to inclement weather will be refunded in full. 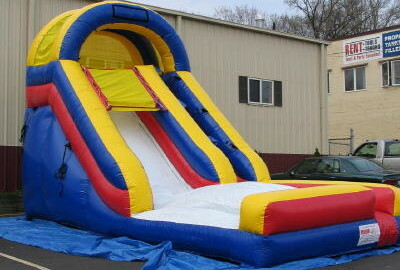 This ride is an inflated water slide and can be used with or without water (if used with water there must be a spigot within 50″ of the unit, you provide the hose).